Eventing getting some love from the Scugog Standard. 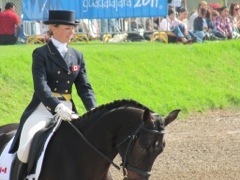 Did you know that 5 of the athletes on Canada’s 2012 High Performance Eventing list are from the Durham region? Kendal Lehari & Daily Edition, Diana Burnett & Shigatzi, Jessica Pheonix & Exponential and Waylon Roberts & Blockbuster III. That can’t be a coincidence. Maybe a secret part of Canadian Eventing’s High Performance plan is bottling the water from the Durham region and passing it out at training camps. A lot of Canadians can be found competing at Red Hills this weekend – Good luck!